Some things leave us open-mouthed in amazement. Dumbstruck. Overawed. With the first flash of a wild tiger, the approach of a herd of elephants or an encounter with a family of gorillas, words fail. We’re left gaping a single syllable: “wow”. We know deep inside that these magnificent animals matter. And yet we’ve driven many of them towards the brink of extinction through relentless poaching. For 50 years, WWF has fought to stop this slaughter. Poaching is the greatest current threat to tigers, rhinos, elephants, gorillas and other African and Asian species. It’s a crime and it’s driving species to extinction. Tigers and rhinos are particularly vulnerable, their body parts being prized in traditional Asian medicine. The old image of a lone poacher with a rifle, man against beast, is far from the true story nowadays. The current wave of poaching is carried out by sophisticated and well-organised criminal networks – using helicopters, night-vision equipment, tranquilisers and silencers to kill animals at night, avoiding law enforcement patrols. Why does this continue to happen? The problem is that poaching is rarely a political priority and is a very lucrative business. We work to tackle poaching and the causes behind it on many levels – from training anti-poaching patrols, to campaigning for stronger action against the illegal wildlife trade, to helping local communities benefit from living alongside endangered species through wildlife tourism. With our partners, we’ve helped to step up efforts to stop rhinoceros poaching in Africa. When we launched our African Rhino Programme in 1997, there were 8,466 white rhinos and 2,599 critically endangered black rhinos remaining in the wild. Today, there are around 17,500 white rhinos and more than 4,000 black rhinos. The three species of Asian rhino remain in grave danger: less than 300 Sumatran rhinos and only around 60 Javan rhinos are left, and poaching is an ever-present danger. “There would be no Javan rhinos in Ujung Kulon [home to most of the remaining population] and Sumatran rhinos in Bukit Barisan Selatan without prompt WWF action to save these species,” confirms Williams. We’re proud of our work stopping the poaching of tigers too. We’re helping boost the number of anti-poaching patrols on the ground, making sure they have the equipment they need to communicate with each other and to act swiftly to tackle illegal activity. “In the eastern sector of Rajaji National Park in the Himalayas, we helped double tiger numbers within a span of five years from 2004 to 2008,” says WWF tiger expert Joseph Vattakaven. Read more about our work to save the tiger. From 2003 to 2010 our work in the Virunga Forest on the borders of the Democratic Republic of Congo, Rwanda and Uganda helped increase gorillas by 26%, from 380 to 480. This happened despite the presence of violent militias in the region – a testament to the bravery and dedication of our anti-poaching patrols. In the 1980s, Africa lost half its elephants to poaching – but since the international ivory trade was banned in 1989, numbers have begun to recover. We helped to bring about the ban, and continue to monitor local sales. Reducing the demand for ivory, and helping local people develop alternative livelihoods, has helped drive down elephant poaching. But there’s still a large black market, and the danger hasn’t gone away. We continue to run patrols and push governments to enforce anti-poaching laws. Asian elephants are rarer – only around 25,000–32,000 remain – so they’re particularly vulnerable. Poaching for ivory and meat is a serious problem, especially in southern and north-east India. Less than 60 Javan rhinos survive – they’re probably the rarest mammal in existence. Poaching could easily make them extinct. 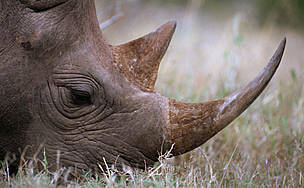 11,065 – number of rhinos in Africa in 1997. Now there are more than 21,000. 2022 – year by which we hope to double tiger numbers in the wild. 100,000 – African elephants killed a year during the 1980s. Unfortunately, poaching has rocketed recently, driven especially by increased wealth in Asia and a demand for exotic or rare species, largely for traditional Asian medicine. In 2010, 333 rhinos were illegally killed in South Africa, threatening the huge progress we’ve made over the last 15 years. “To save elephants and rhinos we need to give them large undisturbed areas that are protected from poachers and development activity like farmlands, mines, drilling and illegal logging,” says Williams. “In some places we are just holding on trying to keep the animals alive, but in other places we are making outstanding progress, swimming against the tide. Similar steps are needed to protect tigers from poaching. We’re fighting to double tiger numbers in the wild by 2022. 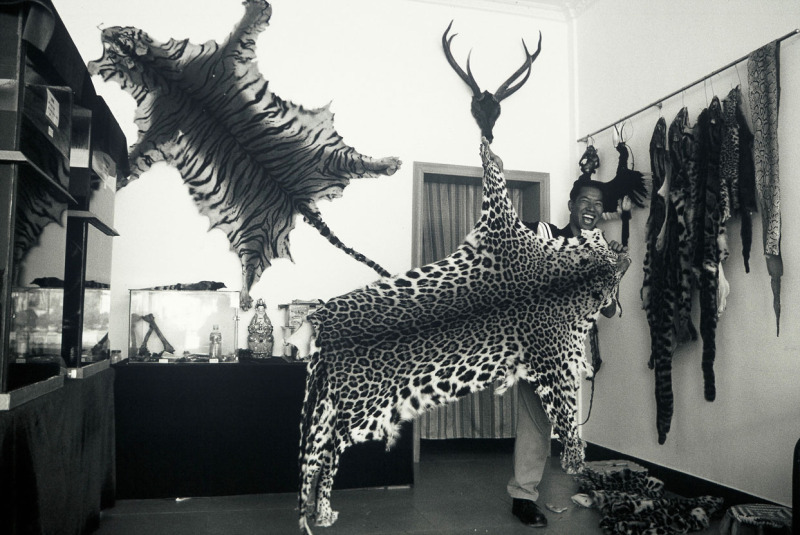 Despite official bans on the use of tiger parts in traditional Asian medicine, there’s still a booming black market. Poaching always has the potential to undermine so much of the work we’ve done to protect endangered species. But we’re determined to use our 50 years of experience to make sure that this doesn’t happen. Videos: Former poacher talks about his transformation to conservationist and what it takes to track and tag a wild elephant. Help us stop the rise in rhino poaching in South Africa. Make a donation today towards much-needed anti-poaching equipment and support for rangers. This includes binoculars, radios, night-vision gear, bullet-proof armour, and rhino-tracking and camping equipment. It will also provide essential training for anti-poaching units and emergency veterinary treatments for injured rhino. 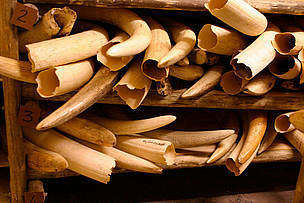 Elephant tusks stored in secured ivory piles. Kruger National Park, South Africa. Black rhinoceros (Diceros bicornis), Nairobi National Park, Kenya. 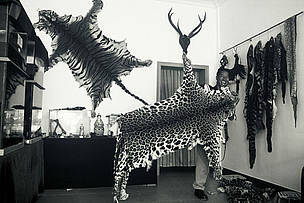 Endangered species skins in Burma.